Lama Gursam went to monastery at a very young age, received teachings as a monastic, and studied and practiced as a monastic. 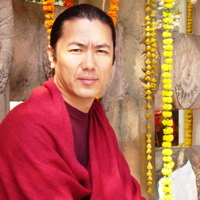 Then Lama Gursam went to study in Tibetan University Sarnath, Varanasi, India to get both bachelors and masters degrees in Buddhist Philosophy, History, and languages. Upon graduation he received a special award for scholastic achievement from His Holiness the Dalai Lama. After university Lama Gursam was requested to assist His Holiness the Chetsang Rinpoche. Lama volunteered for five years as an assistant, as a teacher, and helped with many other duties. Lama Gursam then completed the traditional three year retreat. Since then every year Lama has gone on retreat in various mountains, including some of Milarepa's caves. He then returns for six months each year to provide teachings in the West. He also leads pilgrimages to holy places in India, and Nepal. Lama teaches in English, and always tries to focus on the practical application of the Dharma in everyday life.